"An expert is someone who has stopped thinking." Whatever music an artist musician decides to create IS what it is. It isn't for that musician to determine how good his or her own performing or creative work is; that's for others to decide. It isn't even the musician's place to describe or characterize their own performing ability if asked to do so; what an artist musician thinks of his or her own skills, abilities, or compositional output has no bearing in the exercise of their art, thus no reply is needed when it's merely to satisfy the morbid curiosity of the person doing the asking. The way to respond to that type of question, if it's ever asked, is for the musician to offer the contact information of their most recent teacher to the unfortunate soul doing the asking, and let that teacher do the talking about it, if they wish. If accolades or success happen to come, then the artist musician accepts it and keeps creating; if it fails to come, then the musician still goes about his or her business and keeps creating. The creative musician isn't fazed one way or the other by whether any number of critics or experts happen to like or not like their work, the way they work, or what's being reported or written about it; that musician just keeps working. Let's say a person decides to learn a skill, and they buy the best book they know about it. After finishing the book and doing some exercises they feel like they've mastered it as well as anyone else; their ability has reached let's say from 0 to level 3 and they feel like a pro after this when maybe they don't really have a clue about what "being a pro" means [See blog, Amateur vs. Pro], and they decide to add this to their resume under the "advanced skills" section; they may even rank themselves equals to the best in town, maybe the whole State, a legend in their own mind -- in short, an expert. The reality is, they've just fallen victim to the Dunning-Kruger effect, one of the many biases to which the human mind is prone. This effect, named after researchers David Dunning and Justin Kruger, states that the less competent a person is, the more they overestimate their competence; on the contrary, the more competent people have a tendency to underestimate their competence. Looking at the D-K effect graph (photo), for the middle zone of the curve, one's level of competence and one's self-perception of competence are inversely proportional, i.e., as one rises, the other one falls. It sounds like double talk, but less competent people do not know that they're less competent because they're not competent enough to know they're less competent; in other words, for someone to know they're not competent enough they have to know that their present skill level is way below the level they can reach. They don't know and don't seem to care that there's someone out there who's reached level 10 and is laughing at, if not disgusted with, their arrogant pride in themselves. Of course, they had no inkling about their incomplete competence at level 3 because they had little or no idea that higher levels existed and therefore they assumed that their current level of skill and knowledge was at or near the top. When confronted with new information, the less competent tend to ignore it, not learn from it, and thus remain that way; the more competent realize that there's no end to learning and therefore are constantly taking in new information, learning from it, and thus raising their competence levels. In order for the less competent to learn new information and become more competent they'd need to drop the idea on which they've sold themselves -- that they're a pro -- and this tends to injure the ego; it's much safer for a fragile ego to keep fooling itself into thinking it can hold its own with the best out there than to confront the reality of its ignorance. It's all about maintaining a perceived superiority; and the Dunning-Kruger effect is a specific case of illusory superiority bias, a tendency of people to overestimate their good points in comparison with others while simultaneously underestimating their negative points. Almost everyone has had the experience of noticing or identifying a cognitive bias in which low-ability, low-knowledge individuals suffer from illusory superiority, mistakenly assessing their own ability or knowledge as much higher than it really is ... with those with low ability or knowledge being unable to discern their own ineptitude about the subject and an inability to evaluate their own competence in it accurately. This defines, for all practical purposes, that very small, tiny little minority of insufficiently informed, insufficiently experienced pseudo-afficionados and certified instructors in bovine fecology who, because they can just manage to play, let's say, one brass instrument in a 5-piece band, read from one clef, and know how to work the demo button on their own home keyboard, consider themselves as having expertise about everything musical, including pipe organs and those who play it. They talk about it and can't do it, have never tried to do it, have no real interest in trying to do it, and, without a major reform in their attitude, probably couldn't do it if they did try. 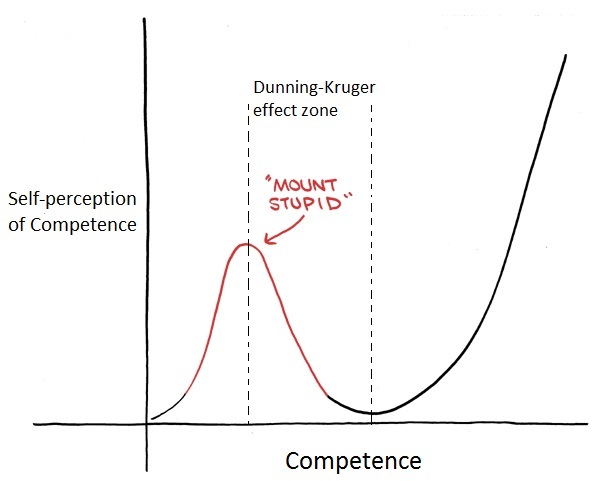 If we ever happen to meet someone like this (and this author has), it's not that this person is deliberately trying to be obnoxious, mean, ignorant or hurtful with the things they say; the problem is, they've fallen victim to the Dunning-Kruger effect, they're stuck on this bump in the D-K graph, a bump having a name with which no one would appreciate being connected. This graph speaks volumes; real, genuine experts travel a route through which there is a dip in their level of self-perceived confidence on their way to attaining that superior level of knowledge and skill at the true expert level. Starting at the beginning, a novice can become confident too quickly about themselves, what they can do, and what remains to be done. This kind of beginner (fortunately for their own sakes there are very few of them) can find themselves trapped without knowing it, stuck on the tip of a hill in the curve, if they think there's nothing much left to learn or develop beyond their own current level; put another way, they can find themselves taking in the view from "Mount Stupid," a misleading place from where they think they've seen it all and have taken in just about all there is. This doesn't mean that they're slow-witted at all; it's simply traceable to attitude, and being a pro is an attitude [See blog, Amateur vs. Pro]. By the same token the beginner who readily admits there's always something more to learn and readily learns from new information will arrive at a stage, as their training and knowledge increases, where they're apt to admit (despite their progress) that they know little or nothing, where their self-perception of their own competency may be far lower than is really the case. We may find them stating that they're not worthy to even be sitting at an important instrument, despite having studied the organ for years with some very inspiring teachers. This is a good indication that their competency has increased in compliance with the Dunning-Kruger effect, that they in fact DO know more and can do quite a good bit more than for which they give themselves credit. A person's self-perception of their own competence, when it's on the low side, therefore may not mean that they're a novice at all; on the contrary, it more likely means that they've left the summit of "Mount Stupid" (if they were ever there at all) in their rear view mirror a long way back and are well on their way to much higher levels of competency and attainment -- which is why it would be a rather serious mistake to under-appreciate the competency of someone performing at the intermediate to advanced level because their humility may be high and their perception of their own competency may be lower than they're willing to admit. Many, many people have never developed hidden talents with which they were born -- they lay undiscovered -- often because, sadly, their own doubts and fears, reinforced maybe by some unsuccessful early attempt, has them convinced that creativity is elusive for them and something only for the other guy to bring into play or realize in action. Which, of course, is ridiculous; every human being on the face of this earth is creative; being able to think about, design, and then assemble or make something from something else is part of the human condition which distinguishes human mind from animal brain; it's the force that's driven all human progress forward since man as a species first acquired knowledge of earth, water, wind, and fire. The difference is, those who exercise a certain modicum of artistic creativity have learned how to overcome what's trying to hold them back and end up winning, instead of losing, their inner creative battles [See blog, The Book, Linchpin, The Lizard Brain, Parts I-VIII]. In the final analysis, in terms of what someone is capable of accomplishing creatively if they only give it a go, there are no losers, only winners, some of whom take longer to develop.